NASSAU, The Bahamas – Mr. Adrian Gibson, Chairman, Water and Sewerage Corporation (WSC) and Member of Parliament for Long Island has announced that the utility company is implementing a digital business strategy that is expected to result in an improvement in operational efficiency and a platform that allows customers and suppliers to interact more easily with the organization. “This is a move to a more efficient organization, and means that we are embracing a new approach to normal ways of doing business for our staff as well as our customers,” said Mr. Gibson. 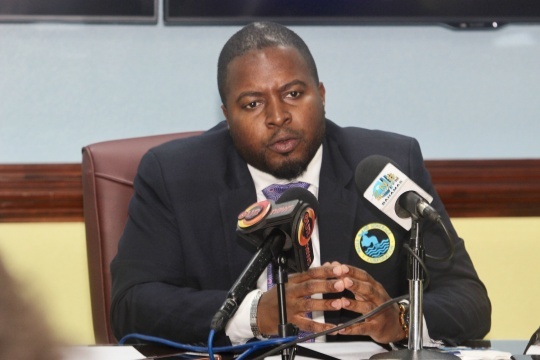 He spoke of the Corporation’s transformation during a press briefing Monday, April 8th 2019 at WSC headquarters on University Drive. Mr. Gibson explained that the Corporation’s goal is to eliminate manual, paper-driven processes and it will undertake a review of all WSC business processes and systems. WSC expects by May 1st to launch a procurement portal which will allow suppliers to manage their vendor accounts and have access to a digital, transparent bidding and procurement process. The Corporation currently offers the following to customers: a customer portal, online account review and bill payment, automatic receipt of bills via E-notification system, IBR Pay by Phone, website upgrade which includes E-forms for jobs, new connections, and the corporation’s mobile app. Customers can use their smartphones to pay, review bills and submit complaints. The app is functional in all of the islands where the corporation provides service.